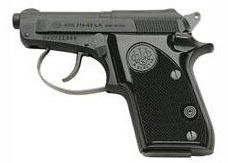 Beretta Model 21 Bobcat. Illustration courtesy of Beretta USA. Modern .25 caliber handguns are almost exclusively semi-automatic (autoloading) pistols chambered for the .25 ACP cartridge. This is a very small rimless cartridge intended specifically for reliable function in blow-back operated pocket pistols. For technical reasons, primarily its longer overall length and the fact that it is a rimmed design, the .22 LR cartridge is inherently less reliable than the .25 ACP in such pistols, although the difficulties can be overcome. In small revolvers, the situation is reversed and the .22 LR is the more appropriate design. This is why there have been plenty of .22 LR revolvers and plenty of .25 ACP autoloaders, but not the reverse. The terminal performance of the two cartridges from very short barreled pistols is similar, with the .22 LR, on average, having a small advantage in stopping power (-2% to +9%, depending on the loads compared). However, neither cartridge has achieved impressive results in actual shootings. In terms of stopping power, these are the least effective of all common handgun cartridges. That is not to say they will not kill. The .22 LR is said to have killed more people than any other civilian cartridge, because it has been around a long time, is so widely used and the waxed or greased lead bullet carries a lot of foreign matter into the wound. Many .22 shooting victims die later of infection. Stopping power, for our purposes, means that the bad guy cannot continue hostile action against the shooter or anyone else after being shot. Whether that individual later lives or dies is irrelevant in this context. The goal is that he or she be immediately incapacitated and unable to do anyone harm. Immediate incapacitation of the aggressor should be the result sought by anyone having to use a handgun for self defense. The chances of immediate incapacitation from the first shot with any .25 Auto load is not high, about 25% with the best expanding bullets and about 23% with FMJ bullets. These are the lowest one shot stop percentages achieved by any modern handgun cartridge. The handgun is basically a defensive weapon. For offensive purposes, there are many more effective weapons, including almost any shotgun or rifle, which is why long guns are the primary personal weapon used by every military in the world. The handgun is regarded as an emergency weapon, something to fall back on if a rifle or shotgun is unavailable. Among all of the common self defense handguns, the .25 ACP autoloader is the least effective and, for most purposes, the least desirable alternative. Typical .25 ACP factory ballistics call for a 50 grain bullet at 760 fps muzzle velocity from a 2" barrel. The muzzle energy of that load is 64 ft. lbs. (Remington figures). The mid-range trajectory is 2" at 50 yards and 8.7" at 100 yards, but the chances of hitting anything at such distances with a typical .25 pocket pistol are remote. Most .25 autoloaders would probably be hard pressed to keep six shots in a 5" circle at only seven yards. The .25 ACP cartridge can be reloaded, but its small case size makes it a finicky project for reloaders and there is little ballistic gain possible. Standard small pistol primers and a pinch (typically 1.0 to 1.5 grains) of a fast burning powder, such as W231, 700X or Bullseye, are the ticket. I would guess that relatively few .25 pocket pistol owners reload for their pets. That said, the first rule of gun fighting is to bring a gun and the sub-compact .25 Auto pistol is one of the lightest, smallest and easiest to conceal firearms around. Hence, its great appeal for pocket, purse and ankle holster carry and the likelihood it will be present when needed. (Women have been known to carry .25 autos in garter holsters, nylon stocking tops and--if sufficiently well endowed--their brassieres.) Only .22 mini revolvers can match the petite .25 autoloaders for ease of deep concealment. The first .25 Auto pistol was the single action, hammerless, 9.7 ounce, 4" long Belgian made FN Baby Browning of 1902. The .25 ACP cartridge made it to North America in the form of the similar John Browning designed Colt .25 Vest Pocket Pistol in 1908. The little Colt was a single action, hammerless, six shot autoloader with a 2" barrel that weighed 12 ounces. It had a long production life, not being discontinued until 1946, by which time 409,061 had been produced. These two groundbreakers were followed by a number of other .25 pocket pistols (including two later Colt models) that made the .25 ACP one of the most popular pistol cartridges of the 20th Century. These days there are .380 and even 9x19mm autoloaders that are almost as concealable as a .25 Auto, but the operative word is "almost." A SIG P238 (.380 ACP) pistol weighs 15.2 ounces with magazine and measures 5.5" in overall length. For comparison, a Beretta Model 21 Bobcat (.25 ACP) weighs only 11.5 ounces and is 4.9" in overall length. The .380 ACP cartridge is far more effective than the .25 ACP and the SIG is a locked breech design, while the Beretta is blowback operated. Carrying the P238 is certainly worth the extra 3.7 ounces and 0.6" in length if your life is on the line. However, if the P238's extra bulk, slight though it may be, means that it simply cannot be concealed on your person and the Beretta 21 can be carried discreetly, then the little Beretta is a whole lot better than nothing. The Beretta Bobcat is particularly interesting due to its design features. One is its DA/SA trigger mechanism. (The seminal FN Browning and Colt .25's were SA only.) Another is its exposed hammer that allows manual cocking. A third is its innovative tip-up barrel system that allows a cartridge to be loaded or unloaded directly from the chamber, without manually operating the slide; racking the slide of such a tiny blow-back pistol can be difficult or impossible for many folks. Today, the number of new .25 automatics on the market has dwindled. The advent and proliferation of sub-compact .380 pistols has no doubt been a major influence, cutting into what was formerly the .25 ACP pocket pistol market. There are also a number of .32 ACP pocket pistols similar in size to .25's. (The .32 ACP is not equal to the .380 ACP, but it is a definite step-up from the .25 ACP in stopping power.) The 104th Edition (2013) Shooter's Bible catalogs only the Beretta Model 21 and Taurus Model 25 (available in several optional configurations). Interestingly, the Taurus is a tip-up barrel, blow-back action pistol based on the basic Beretta design. There may be other, more obscure, .25 autoloaders out there, but they are unknown to me. Despite the overall decrease in .25 pistol models, the Beretta and Taurus are both good sellers. The .25 ACP cartridge itself remains popular. Being the smallest cartridge designed specifically for autoloading pistols, it isn't going anywhere. Designers looking to build the smallest possible pocket pistol will always gravitate to the smallest cartridge. When miniaturized to the max, a .25 ACP pistol can be designed a bit smaller than a .32 or .380. Note: A full length article about the .25 ACP can be found on the Handgun Cartridges page. Copyright 2013 by Chuck Hawks. All rights reserved.